First up - the Turkey Wagon! That's the name of this cute Amuse stamp that I used on my challenge card. Holly's DTGD challenge over on Split Coast was to use her sketch and use lots of layers - which is what she usually does on her own cards. This is the sketch - I turned it on it's side to accomodate my turkey wagon image! I think I have 7 layers on this card - if I count them correctly! I pulled out this fun designer paper by Basic Grey called Deciduous and that led me to get this Turkey Wagon stamp by Amuse out to go with the trees! I colored my image with Prismacolor markers. The sentiment was in a clear $1 pack from Michaels. I added 3 dew drops in the top left corner to balance the sentiment. I attached the sheer dotted ribbon under the image and over the panel - I think it looks like the road the wagon is driving through the woods on! The ovals are all cut with my Nestability dies on my Cuttlebug. The Apricot Appeal panel is embossed with the Swiss dots Cuttlebug folder. 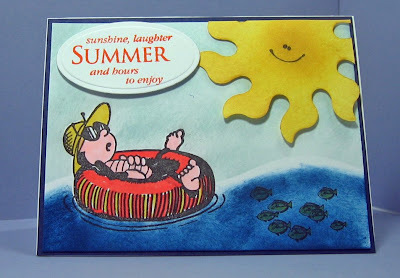 Fun in the Sun is my card for Stef's Inspiration challenge over at Splitcoast. 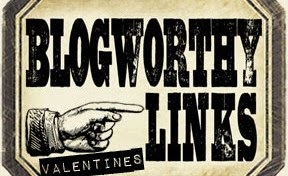 We were to find a blog banner that inspired us. Well - just as I was going to go look at some blogs - the ad for the cats pajamas stamps was showing at the top of the SCS screen and it had a cat in an innertube (and I have a stamp like that - well the inner tube part - not the cat part) so I clicked on it and found this. And it was my inspiration to make this card. I stamped my fun bug in his inner tube - masked him and sponged the ocean and sky, added a school of fish to the ocean and a sizzix die sun that I sponged with So Saffron and stamped a little face on. I cut the oval with my nestabilities and stamped the summer sentiment. The sun and sentiment are up on dimensionals. 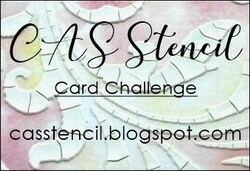 Now go find a blog banner that inspires you to make a card!! And finally, The Wedding Souls is my card for Joan's DTGD challlenge at Split Coast - to use a silhouette stamp on your card. 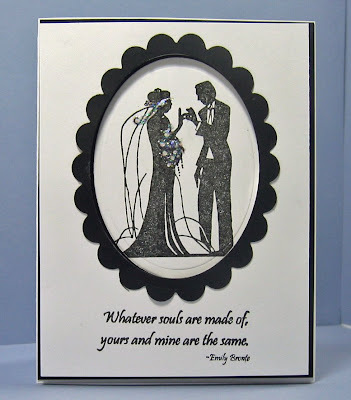 I used this lovely wedding couple stamp from Artful Inkables Wedding Silhouettes set. 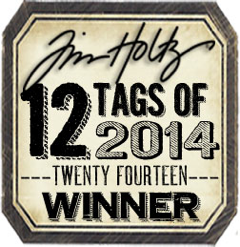 I stamped it in black on white card stock and cut and embossed it with my oval nestability. I mounted the panel with thick foam dimensionals over the image. This also qualifies for the Ways to Use It Challenge - Negative thoughts - I used the outside (negative) piece left after cutting out the oval. I added stickles to the bouquet and head dress for a little sparkle. Just a reminder: this Artful INKable wedding set is 10% off until the end of July so go on over there if you're thinking you need this pretty set! 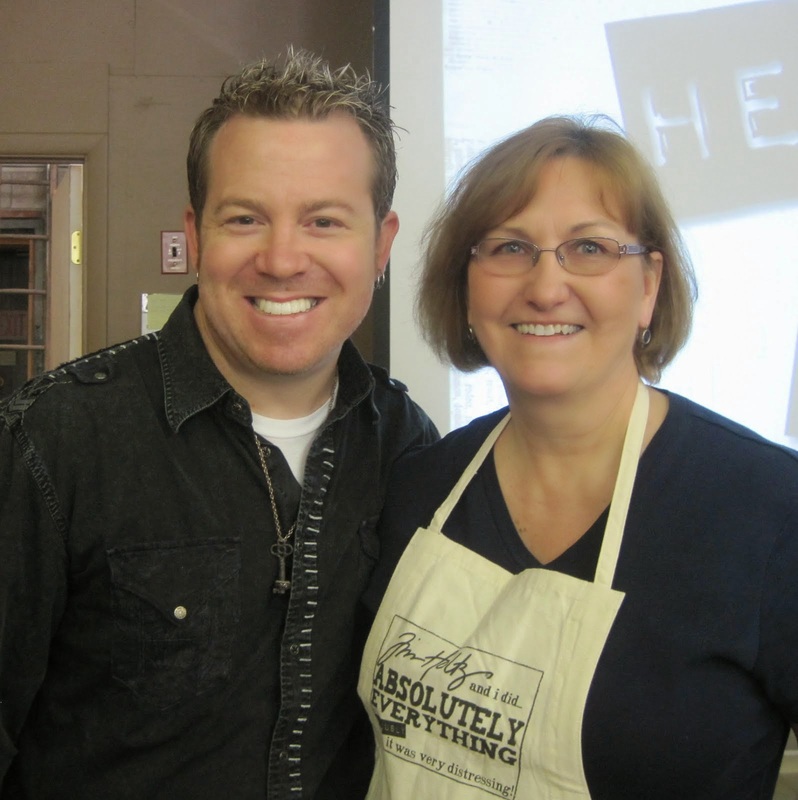 A Butterfly - a Country Home - and an Anniversary Celebration! 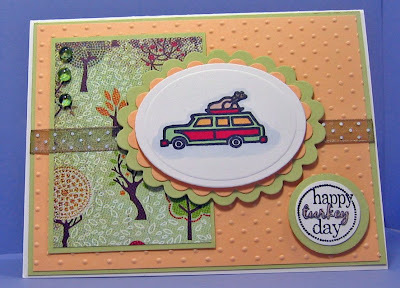 Susiestampalot was the Featured Stamper today on Split Coast and I chose this lovely card of hers to CASE. Things I changed: I made mine a full card rather than an Artist Trading Card, used a butterfly instead of a flower and changed the colors - but I liked her layout and used that. 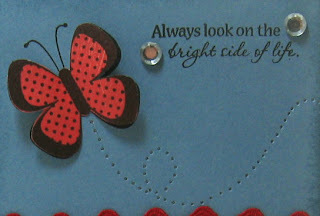 I stamped the butterfly on the card stock as well as on a piece of designer paper. I cut it out of the DP and attached it over the stamping - bending up the wings. I pierced the flight pattern added the colorful Basic Grey designer paper and ric rac on the bottom half. My second card is from the Inspiration Challenge on Split Coast. I love the inspiration pieces - country folk art by Kay Lamb Shannon shown to us by Anne (itsapassion) who guest hosted the challenge. 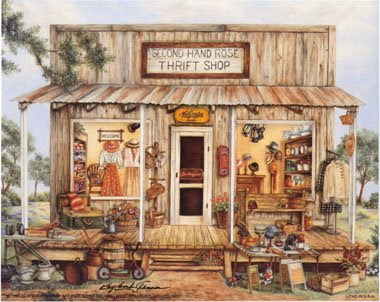 I chose this fun thrift shop picture to be inspired by. As you can see - I had the close to perfect stamp for it - one I've had for some time and never inked yet (how many of those do we all have!!!???). It is an unmounted stamp and unfortunately I didn't write the name of the company on the stamp so I forget where I got it! 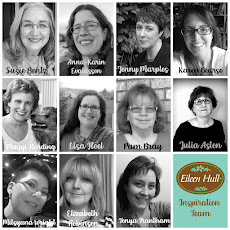 Edited: I got the stamp at Alotastamps - a fellow SCS'er let me know she saw it there!! thanks I should have realized that - they have a lot of super fun stamps! There are so many fun details on this stamp which is pretty big - it took up the full 4.25x5.5 card here. 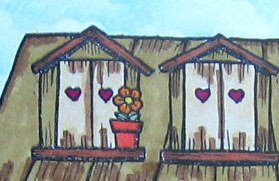 The 2nd story shutters have little hearts cut into them and a couple of flower pots sitting on them! The polka dotted curtains and field stone foundation add to the homey look. I made the clouds using a home made cloud template (from a punched scallop circle - then sponged over the edge and kept moving the template up) you can see how I make clouds on this post - and the grass is stamped. 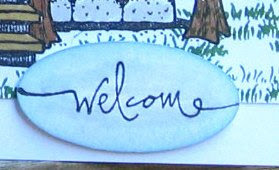 I stamped the 'welcome', punched it out with my oval punch, sponged the edges - went over the word with a gray Prismacolor marker and mounted it with foam dimensionals. DH, Kent, and I were up at Bailey's Island - off of Portland, Maine - this weekend attending a 60th wedding anniversary of his cousins parents. They live in a beautiful spot overlooking the ocean for 4 months of the year - here are some pictures of our day there. There are 3 cottages on their property - this is the largest one where they live - their children or guests stay in the other 2 when they visit. This is the view of the ocean from their cottage. This is a piece of artwork on the property - they have things like this in several locations! This is the view from the lower cottage - right on the ocean! And here is the bride - Joanne - standing - and her husband Walter, seated to the right. The dinner was actually held in a 'still being built' garage on the property - being the only room large enough to hold about 18 people! It was a lovely place to celebrate a momentous occasion with family and good food! Well, here we are at Wednesday - half way to the long Memorial Day weekend here in the US! I was home late from work tonight so I wasn't able to do the sketch challenge over on SCS! I don't remember when I've missed that last! 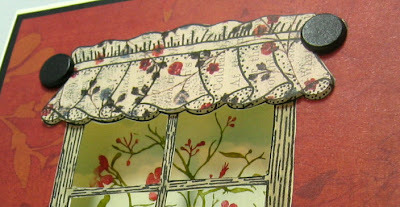 But I did complete this fun window card that I started yesterday. I made this for the weekly Double Dog Dare Challenge I do with a group of friends on SCS. It was Anne's (Itsapassion) turn to give the challenge. Her instruction was to use a window or door on your card. I just love this great curtained window stamp from Alotarubberstamps - and it's just been sitting in my drawer since I bought it - never seen ink - so out it came! I decided to cut out the panes and have the window look onto the inside of the card. I paperpieced the curtain and popped it up on dimensionals. I added large brads where the balls of the curtain rod were stamped. You can see this close up here. I colored the frame with an Oatmeal Prismacolor marker. I stamped the window on the Very Vanilla base card - but then realized it needed colors around it - so I cut out the center of a black panel so it wouldn't block the window! and attached that. Then I stamped the window again on the rust designer paper panel, cut along the outside edges of the window, and attached that piece around the original window. Phew! This card is large at 5 1/2 x 5 1/2. I'm going to have to cut out another piece for the inside behind the window as the brad ends show there - but you don't know I didn't do that yet right!!! So we'll pretend it's already done and looking lovely! Here is the inside of the card where I made clouds using my home made cloud template, (see my post on how I do this here.) sponging soft sky ink over it. Then I colored the flower stamp from Stampin Up's Essence of Love set with my Stampin Up markers in Ruby Red and Old Olive - huffed on the stamp after coloring to keep it moist - and stamped it over the clouds. I stamped the sentiment at the bottom so you don't see it from the outside of the card. I love my little window scene - don't you? - this challenge made me get creative which is the exact intent! 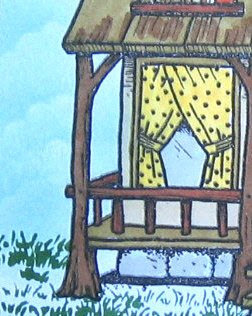 You can see the other ladies window/door challenge cards here. I so appreciate your stopping by and taking a look at my work! Today's quote from Poor Richard's Almanack by Ben Franklin: "The doors of Wisdom are never shut."